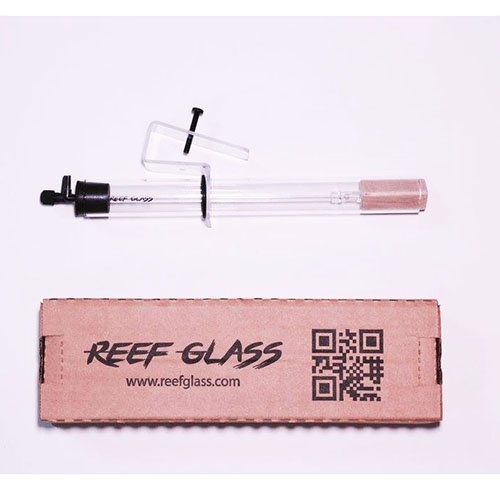 Classic limewood protein skimmer for nano reef aquariums, made with high quality glass and materials. Includes acrylic mount, limewood air stone, airline, valve, connectors and everything you need to start skimming. Just add an air pump and a waste bottle of your choice. Rubber stopper and barbs may add approx 2.5cm to the overall length. 1. 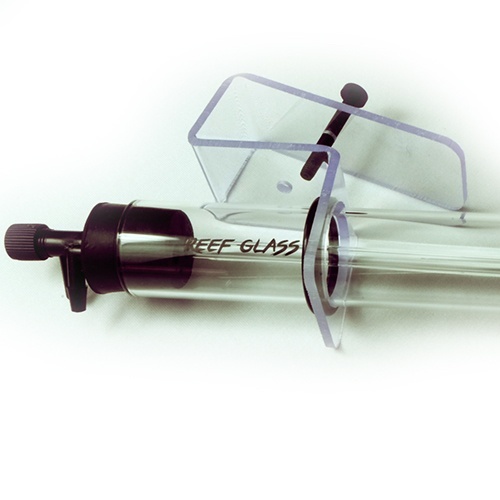 Glass Skimmer: Made with high quality Pyrex glass. It has a simple and practical straight shape so you can remove the air stone from the top without having to unmount the skimmer. 2. 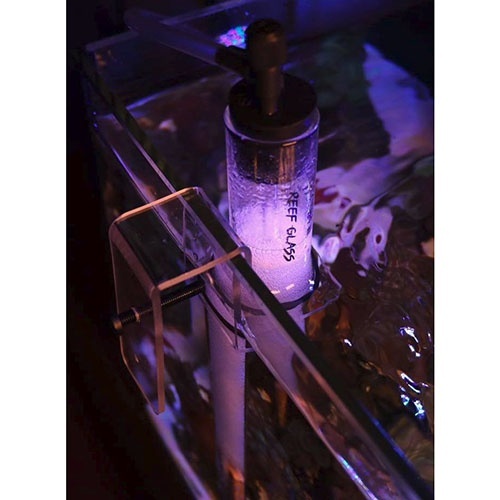 Acrylic Mount: Versatile mount allows you to install the skimmer on most rimless and rimmed tanks. 3. Mount Screw: Can be screwed on the back of the mount for rimless tanks and on the front of the mount for rimmed tanks. 4. Rubber Stopper: Has an air inlet hole and a waste drain hole. The air valve must be placed into the air inlet hole and the elbow connector must be inserted into the waste drain hole. 5. Limewood Airstone: Made of high quality limewood, produces microbubbles that trap the waste that is subsequently drained to a waste container of your choice.We highly recommend using only the manufacturer's limewood airstone as these are made specifically for this glass while others may expand and get stuck. 6. Rigid Acrylic Tube: One end must be inserted into the air inlet hole on the bottom of the rubber stopper. The other end has a flexible connector for connecting the limewood airstone. Comes pre-assembled for your convenience. 7. O-Ring: Holds the glass skimmer on the acrylic mount and can be repositioned for height adjustment. 8. Air Valve: Must be inserted into the air inlet hole on the top of the rubberstopper. Use it to adjust air flow to the limewood airstone. 9. Elbow connector: One end must be inserted into the waste drain hole onthe rubber stopper. Connect a length of flexible tubing to the other end of the elbow long enough to get to your waste container. 10. Flexible tubing: We included 4’ of flexible tubing. 11. Straight tubing connector: Can be optionally inserted into a hole on the cap of your waste container or to connect airline tubing directly to the air inlet in case you prefer to use your own in-line air valve. • Air Pump: We recommend a Whisper 10, Whisper 20 or similar pump. • Waste Container: It can be as simple as a used water bottle. Air must be able to exit the container at all times for proper operation, so we recommend that you leave the waste container uncapped. If you decide to place a cap, then you must drill 2 holes on the cap, one for inserting the included straight tubing connector and another one for allowing air to exit. The hole for the connector is approximately 5/32” (drill bit size).